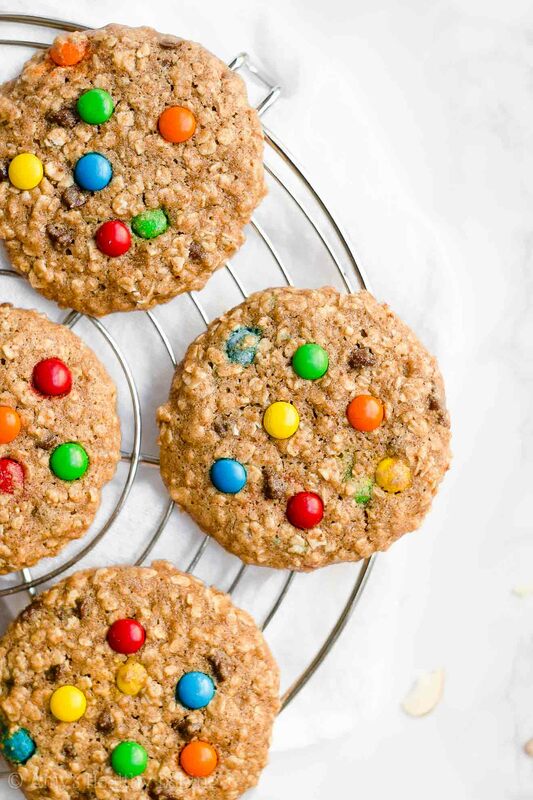 Learn how to make these chewy monster cookies from scratch! 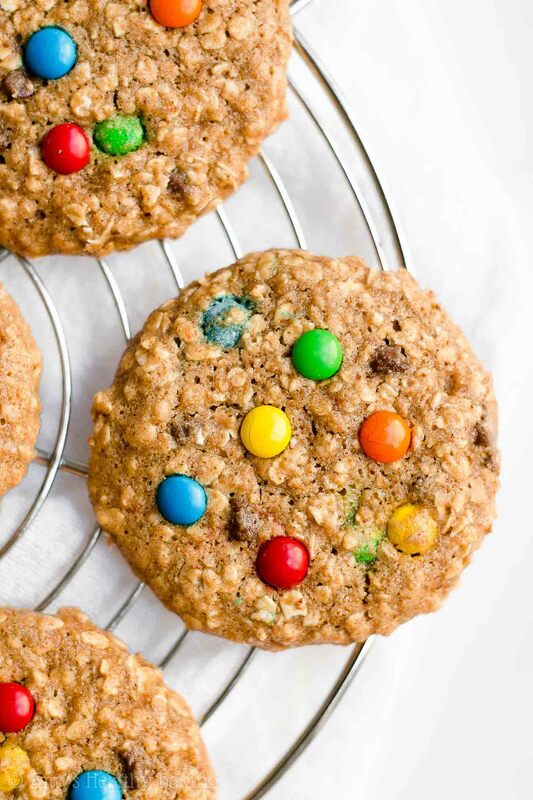 Almond butter + oats + chocolate chips + M&Ms! Surprisingly easy to make & only 112 calories! Last week, our usually quiet neighborhood experienced a bit of excitement when a fleet of cop cars drove through… And stopped directly behind my backyard to arrest somebody. As soon as I saw that police SUV with its flashing lights screech to a stop just inches away from my fence, I grabbed my dog and ran upstairs. I felt a little safer from that vantage point! While peeking through the blinds from my bedroom and keeping an eye on the scene unfolding below, I grabbed my phone to text my neighbor and check on them. Yet before I could type a single word, my phone started ringing… She was calling me! We talked for a few minutes, sharing details of what we each could see from our bedroom windows, until I heard her three-year-old daughter in the background. Once her little girl realized the police cars were right beside my fence, she apparently asked her mom to call and check on me—she was that worried about me! I spoke to the little girl for a bit on the phone, reassuring her that my dog and I were both safe and sound. A few minutes later, once the cops waved up at all of us watching from our bedroom windows to give us the “all clear” (what a funny sight that must have been, to see a half dozen houses’ worth of people staring down at you from their second stories! ), we all ventured out into our yards and stood on patio chairs to talk to each other over the fences. She loves chocolate as much as I do, and since she always asks me if I have chocolate to give her whenever I see her… That was the most precious thing for her to offer her own prized chocolate to me! A couple of days later, I baked a batch of these Healthy Almond Butter Monster Cookies to bring her to say thank you. They’re soft and chewy with plenty of chocolate—exactly the way we both love our cookies! 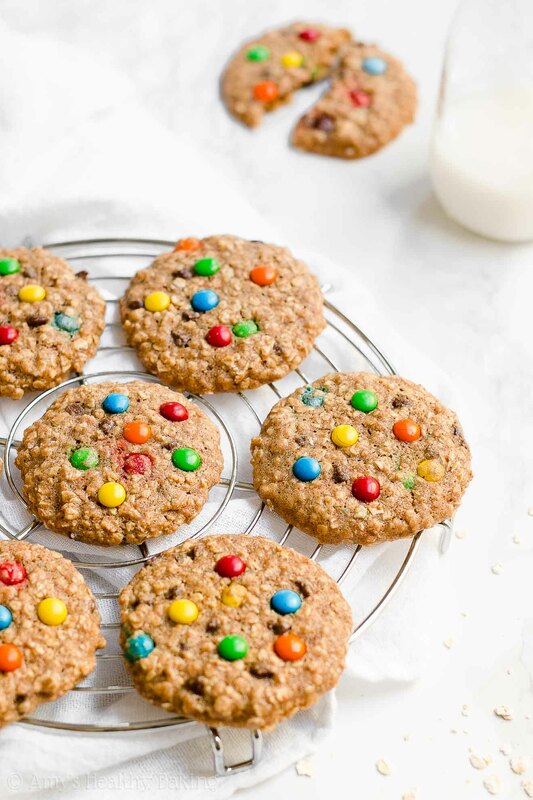 Yet unlike traditional monster cookies, these contain no refined flour and only 112 calories! And her health-oriented personal trainer mom definitely appreciated that! ? Let’s go over how to make these healthy almond butter monster cookies! You’ll start with instant oats (this kind—or these for a gluten-free version!) and whole wheat flour (or my favorite gluten-free blend that’s in the Notes section!). Instant oats are also called “quick cooking” or “one minute” oats. 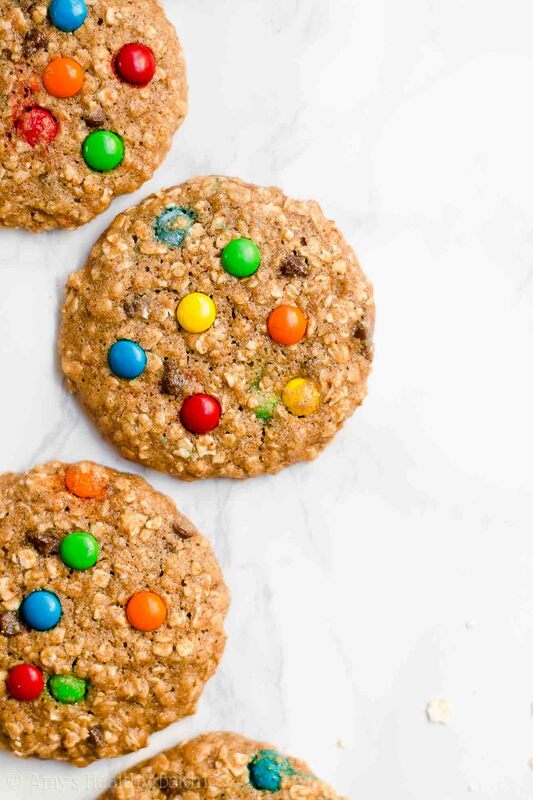 They’re smaller and thinner than traditional old-fashioned rolled oats, which makes them perfect for these chewy healthy almond butter monster cookies because they soften much faster! Remember, it’s extremely important that you measure the oats and flour correctly, using this method or a kitchen scale. (← That’s the one I own and love!) Too much of either will dry out your oatmeal cookie dough and make your cookies taste cakey, rather than chewy. This is especially true of the oats because they act like little sponges and soak up as much moisture as they can! 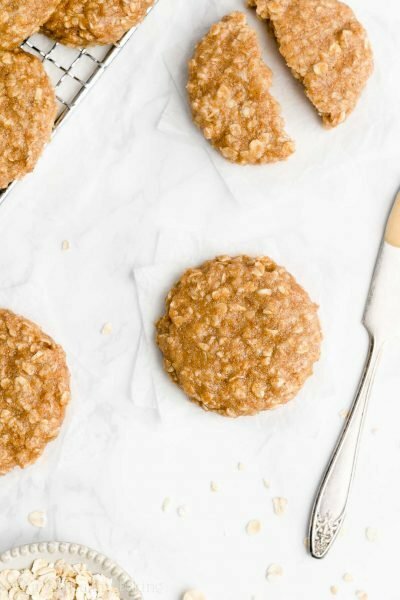 While traditional monster cookies are peanut butter oatmeal cookies with various mix-ins, we’re using homemade creamy almond butter for this healthy version! This is my go-to almond butter recipe. You just need 10 minutes and a blender to make it! Hint: If you’re using store-bought almond butter, make sure it’s the natural drippy-style kind where the only ingredients are almonds and salt. It should be somewhat liquidy at room temperature! 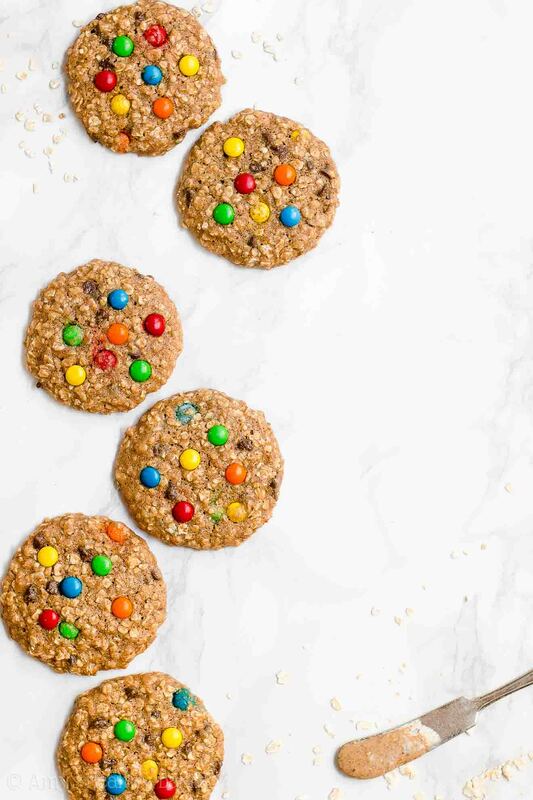 To keep these healthy almond butter monster cookies low-calorie, you won’t add any butter, oil, or egg yolks. 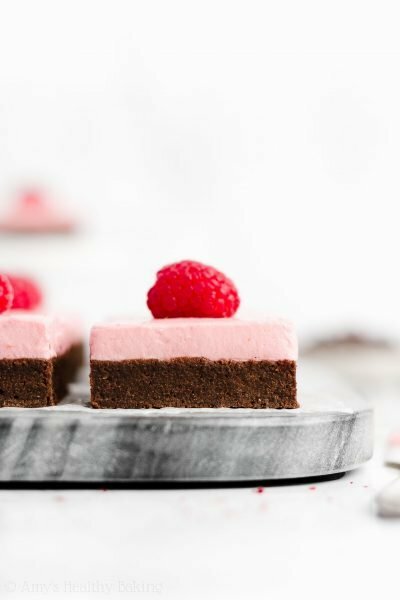 Yet they still taste extremely soft and chewy and indulgent—I promise! Then you’ll sweeten your healthy almond butter monster cookies with pure maple syrup (like this!). You want the kind that comes directly from maple trees. The only ingredient on the label should be “maple syrup,” and it’s generally sold in thin glass bottles or squat plastic jugs (like this!). Time for the best part… The chocolate! 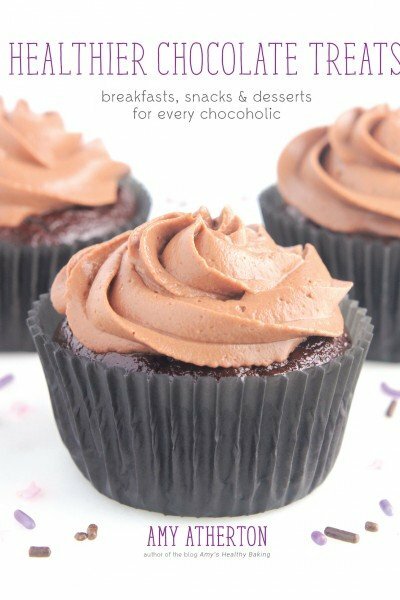 You’ll use mini chocolate chips (I’m obsessed with these!) and mini M&Ms (this kind!) in your healthy almond butter monster cookies. Two types of chocolate definitely made my chocoholic little neighbor (and me) really happy! I always save some of the M&Ms to press into the tops of the cookies just before baking. I think it makes them look even more irresistible! Although looking this irresistible might be dangerous… ? And when you make your own, remember to snap a picture and share it on Instagram using #amyshealthybaking and tagging @amyshealthybaking IN the photo itself! (That guarantees I’ll see your picture! ?) I’d love to see your healthy almond butter monster cookies! 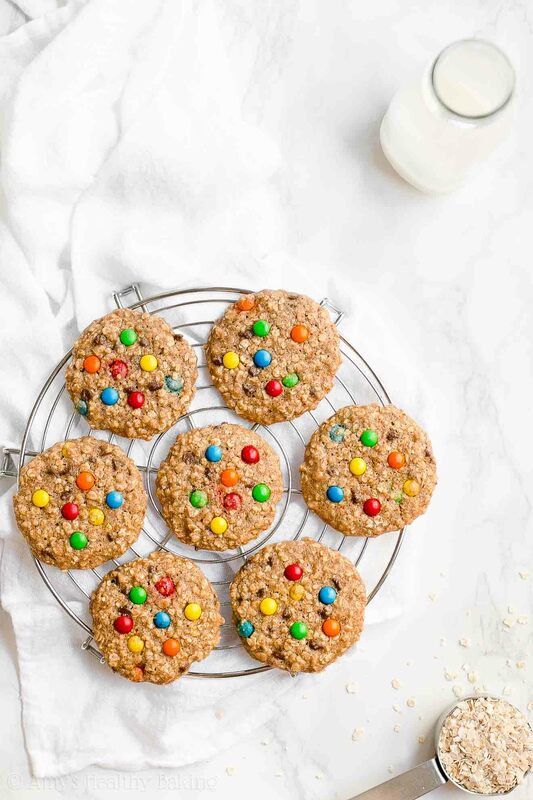 These are a fun little twist on classic monster cookies! Almond butter replaces the peanut butter, but they still have lots of oats, chocolate chips, and M&Ms! These soft and chewy cookies will keep for at least one week if stored in an airtight container. In a medium bowl, whisk together the oats, flour, baking powder, cinnamon, and salt. In a separate bowl, whisk together the egg white and vanilla. Stir in the almond butter until fully incorporated. Stir in the maple syrup. Add in the oat mixture, stirring just until incorporated. Fold in the miniature chocolate chips and 1 tablespoon of miniature M&Ms. Chill the cookie dough for 20 minutes. Using a spoon and spatula, drop the cookie dough into 15 rounded scoops onto the prepared sheet, and flatten slightly using a spatula. Gently press the remaining miniature M&Ms into the tops. Bake at 325°F for 10-12 minutes. Cool on the pan for 10 minutes before turning out onto a wire rack. Notes: It’s extremely important to measure both the oats and flour correctly using this method or a kitchen scale. (← That’s the one I own and love!) Too much of either will dry out the cookies and leave them cakey instead of chewy. Instant oats are also known as quick-cooking or minute oats. They come in large canisters, just like old-fashioned oats. They are not the ones in the small flavored packets of oatmeal. 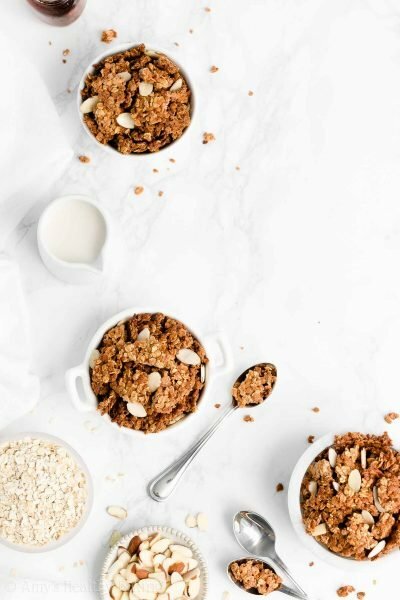 To make your own, add the same amount of old-fashioned oats to a food processor, and pulse 10-12 times or until the oats are about ¼ to ⅛ of their original size. This is my favorite homemade creamy almond butter recipe. You just need 10 minutes and a blender to make it! If using store-bought creamy almond butter, make sure it only contains almonds and salt—no other ingredients. It should be liquidy at room temperature. Do not substitute crunchy almond butter. For a clean-eating version, substitute additional miniature chocolate chips for the miniature M&Ms. 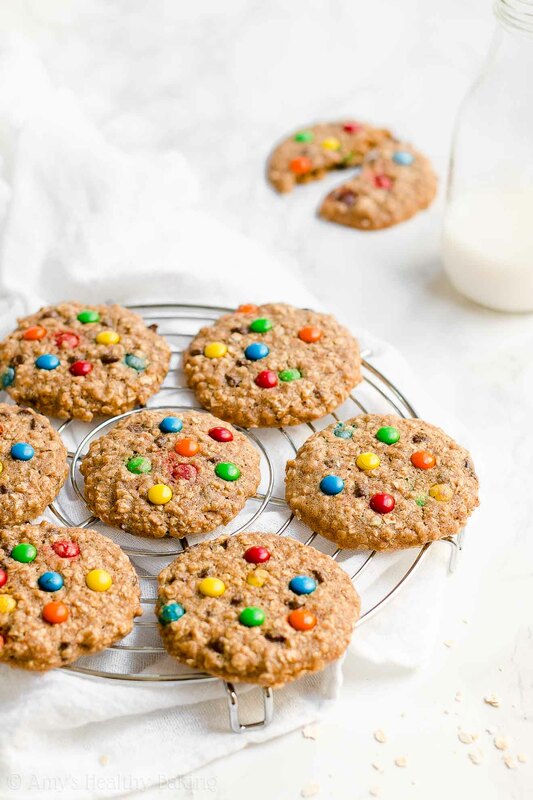 ♡ …and the rest of Amy’s healthy oatmeal cookie recipes! Yikes! So so glad you’re safe; and what a delicious thank-you treat. Love the almond butter addition to classic monster cookies. That would be a scary sight if it was all going down in your backyard. The cookies sound delicious! We love all things monster cookies so I’m sure they will be a big hit. Hi there Amy! 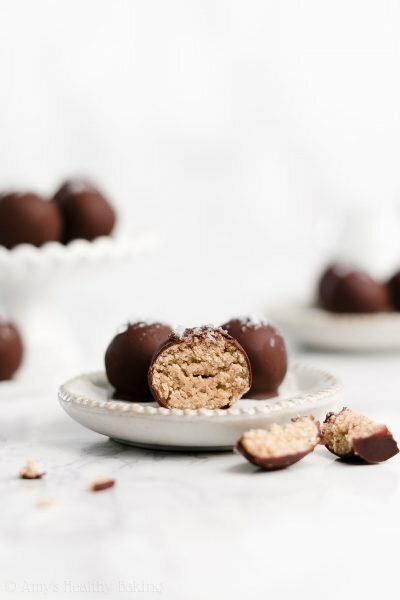 I would love to make these but I can’t have oats ? Any suggestions on substitutions? I really appreciate your interest in my recipe, Briana! If you can’t have oats, then I’d recommend this chocolate chip peanut butter cookie recipe of mine instead. You can easily substitute almond butter for the PB and mini M&Ms for some of the chocolate chips! Another option would be to use barley flakes (this kind!). With the barley flakes, pulse them in a food processor or blender until they’re less than 1/8th of their original size. They don’t soften while baking nearly as well as oats, so I highly recommend sealing the cookies inside of an airtight container for 24 hours after they’ve baked and cooled to help the barley soften a bit more. (That extra “resting” time makes a huge difference in the texture!) 🙂 I’d love to hear what you think if you decide to try either of those options! 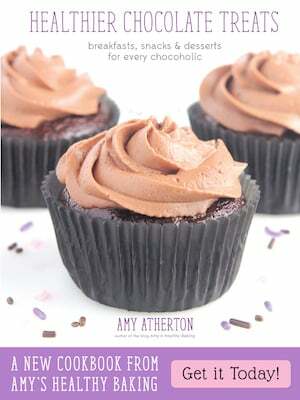 Hi Amy, Your recipe is looking so yummy. I always love to make something new. This time I found this, and I am interested in making this. I can’t wait to try this. Hope so my kids also love it. Thanks for the sharing this yummy recipe tips.